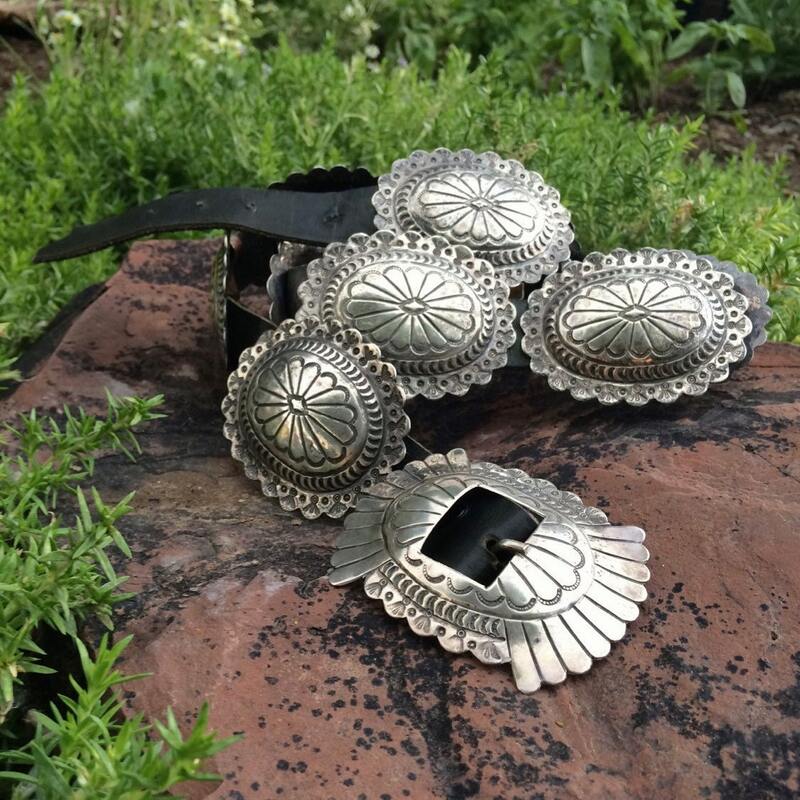 Here we have a traditional hand-stamped sterling silver concho belt featuring eleven conchos, including the buckle, on a supple leather strap. 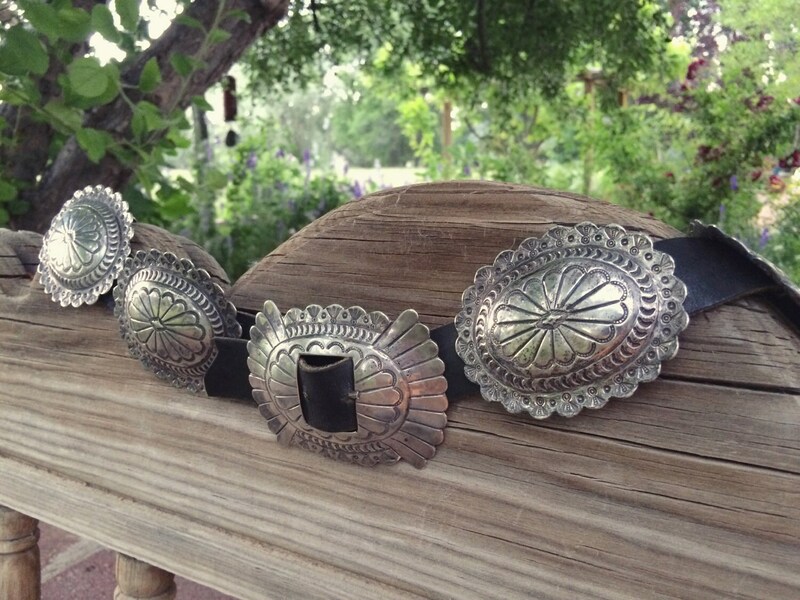 The belt came from the estate of a family that in the 1970s traveled all over New Mexico buying directly from Native Americans and reselling to retailers in Old Town Albuquerque. We do not know for sure that this is Native American, as it is not signed, but we do know that the family kept this piece for themselves over more than 40 years. We believe this to be Navajo. The belt measures just under 39-1/2" long from the tip of the buckle to the tip of the leather strap, and the strap is about one inch in width. Size from first hole in the leather strap to the hook: 33". Size from last hole to hook: about 36-3/4". Belt Sizing rule of thumb: Since conchos are generally worn low on the hips versus at the waist, take your hip size and add 4” to it. For example: 34 hips = 38" belt size. This leather strap is clearly ideal for someone on the slimmer side. 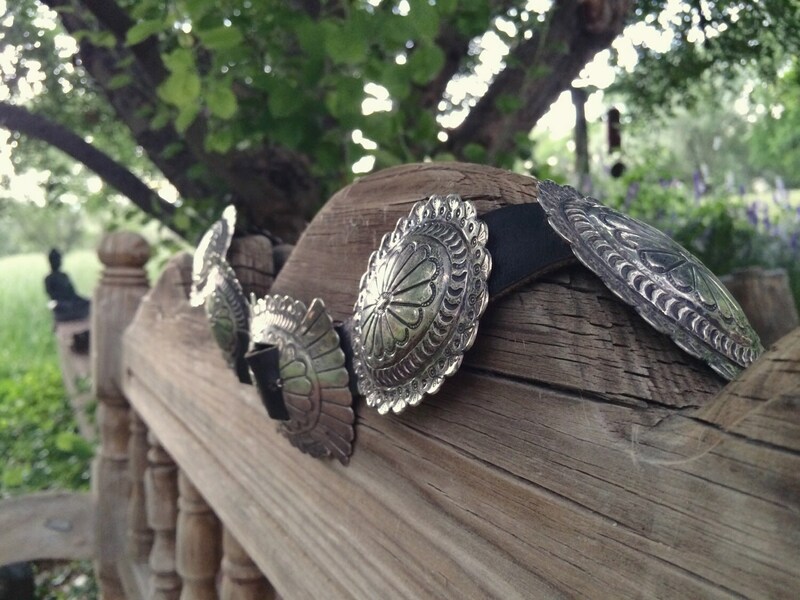 There are enough conchos to space them out on a larger strap with some space between each concho, as they touch up to one another on this belt. 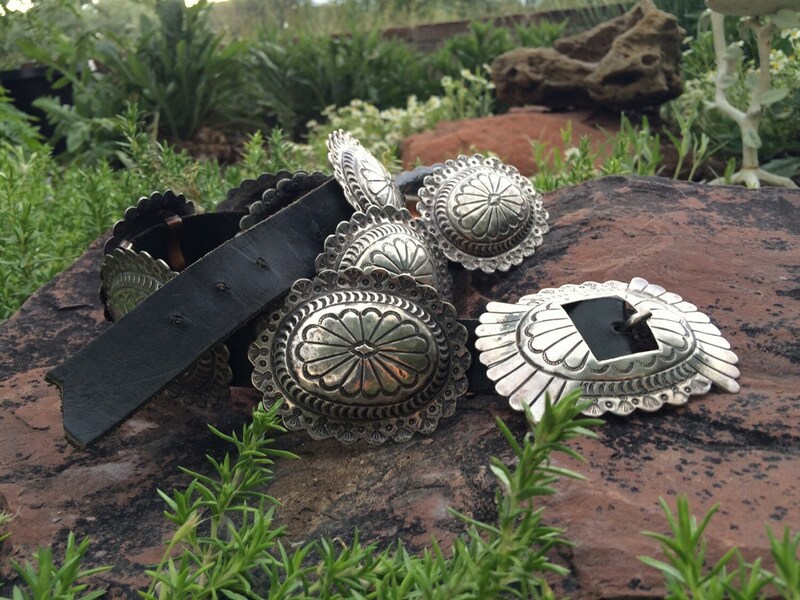 Traditional copper backs make it easy to slip on and off conchos. The belt has ten conchos not including the buckle, so 11 total. 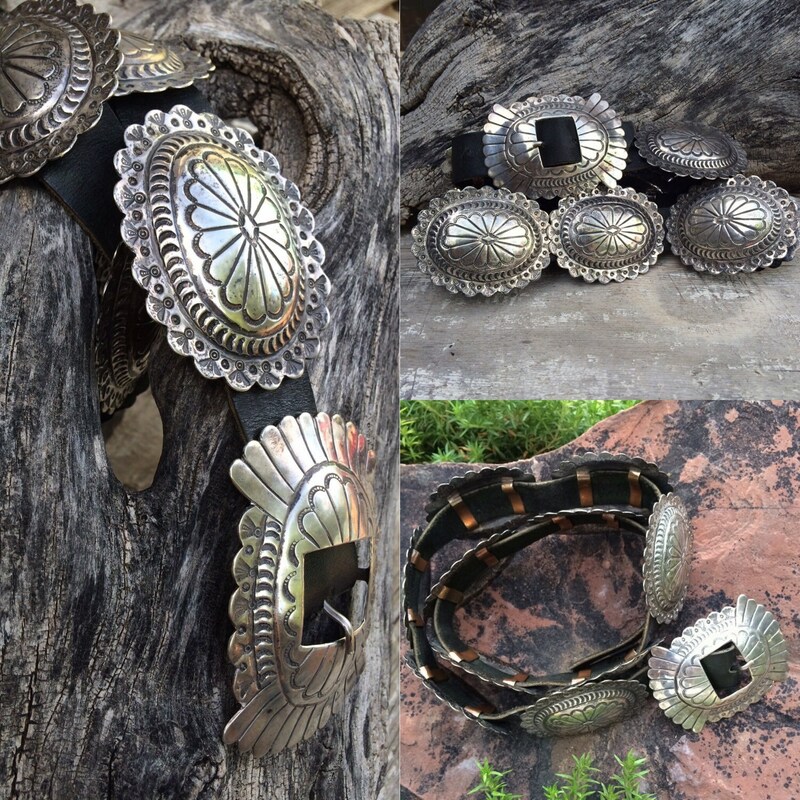 Each of the ten non-buckle conchos measures just over 3" wide by about 2-1/2" tall. Note that each is hand made and hand-stamped so expect irregularities in the conchos--a case where imperfection is actually perfection. The buckle measures 3-1/2" by 2-1/2". I cannot say enough about what a gorgeous piece this is and how excited I am to have it in my shop. It has been gently cleaned, not enough to take off the patina entirely. The back is still darkened from age. In great vintage condition.